Want to learn more about risk informed gambling practices? Below you will find links to a range of research on the topic. Walker, D. & Sobel, R. (2016). 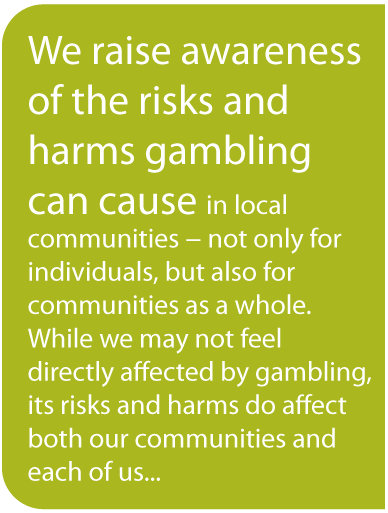 Social and Economic Impacts of Gambling. McCarrey, Henry, von Hippel et al. (2012). Age Differences in Neural Activity During Slot Machine Gambling: An fMRI study. Plos One. DOI: 10.1371/journal.pone.0049787. Williams, R.J., Rehm, J., & Stevens, R.M.G. (2011). The Social and Economic Impacts of Gambling. Final Report prepared for the Canadian Consortium for Gambling Research. March 11, 2011.
http://www.gamblib.org/catalogue/publication/350/: provides research on gambling issues through various articles and reports. http://jgi.camh.net/index.php/jgi: The Journal of Gambling Issues, through the publication of peer-reviewed articles that focus on gambling as a social phenomenon and the prevention and treatment of gambling problems, aims to help make sense of how gambling affects us all. Ted Talk featuring Dan Gilbert: Why We Make Bad Decisions (Video). The discussion below it (on TED) gives interesting insights into other points.